The meeting began at 11:30am with silent worship. Olney Friends School in Barnesville, OH refused to permit energy companies to utilize hydraulic fracturing (fracking) on their land, even though the surrounding farms did sign contracts. Olney's board of trustees stood their ground as stewards of the property. M&C met on 5/4/14. They discussed ways to reach out to newer attenders to get to know them better. They held several of our members and attenders in the Light. Judy discussed the new member Friends Journal benefit with Sarah. Sarah chose the on-line version of Friends Journal. Ann will be leaving for Michigan on 5/18. Pam will clerk this committee in her absence. We decided to meet during the summer only as needed. Adults: June 1st will be a discussion on Linking the Quaker testimonies to Earth Care. Adrian Fisher will lead this and provide an e-file for review prior to the discussion. No sessions will take place in July or August. 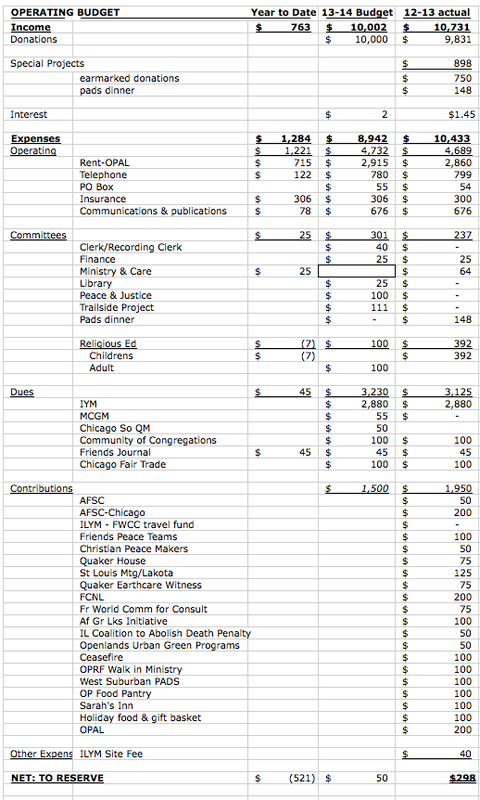 With no P&J clerk nominated for 2014-2015, our Meeting will collaborate with other organization striving for peace & justice such as the Oak Park Coalition for Truth & Justice and the Community of Congregations. Announcements from these organizations will be posted in OPFM weekly announcements when appropriate. New member luncheon for Sarah Shirk is scheduled for June 29th, noon at the home of Kelly Maynard. Sign-up list & carpool list provided by Kelly. Laura Goode requested contributions for FWCC trip. OPFM will match the gift offered to her sister Claire. ILYM statistical report was sent. June 18-22: IL Yearly Meeting, McNabb. Worship, workshops, speakers, recreation. Meet Friends from the wider Quaker world in a serene rural setting (just a 2-hour drive from Chicago). Christina Timme is seeking work. Please call 708-927-4940 with odd jobs & potential long-term employment opportunities. Candy Boyd with St. Louis Meeting has managed Project Lakota, and we honor her for her faithful work. Bob maintains the hard copy mailing list for newsletters, not Pam. Year-to-date income is $7,491 and year-to-date expense total is $8,442. M & C Report: We met on 3/30. The clearness committee met with Sarah with concern for her request for membership. We have received a favorable report and will make a formal recommendation at the 4/13 Meeting with Concern for Business that she be accepted as a member with joy and celebration. Queries related to the State of Society report were discussed on 3/30 by the broader Meeting community; a report will be brought to the 4/13 meeting. Our next M&C meeting will be at 8:30am at OPAL on 5/4. Sarah Shirk's membership request was accepted with great joy. A party to celebrate her membership will take place at Penny's Noodle Restaurant after Meeting for Worship with attention for business on 5/18. State of Society report was edited and approved. All references to the Oak Park Friends Meeting should use a capital M for Meeting. Clerk will ask Adrian to write article for Among Friends concerning the State of Society report process. Adult religious education will be continuing with the Painting the Stars mid-week program. On May 4th a field trip is planned at Inspiration Kitchen followed by a labyrinth walk at Garfield Park Conservatory. M&C committee is asked to discuss the future of the mid-week meetings. Thirteen people attended the initial meeting. Chicago Friends School is accepting k-3rd grade applicants for the 2014-2015 school year. Head of School position will be posted. Mandy, Sue, and Bob are continuing to fill the nomination slots that are open. A Day in Our Village will take place on June 1, 2014. No volunteers for the booth stepped forward so no OPFM booth will be reserved. ILYM Women’s Weekend will take place April 25th-27th in McNabb, IL. The theme is "Sharing Our Stories, Reveling in Joy." For more info go to ilym.org. Bill Howenstine is appreciated for his clarity of purpose and ability to re-center people during meetings. Old business has a date error. The Chicago South Quarterly Discussion took place November 11, 2013 NOT 2014 as stated. Year-to-date income is $7,076 and year-to-date expense total is $8,100. Treasurer Valerie Lester expects income and expenses to be close to budget. Minute: We have a need for a central database for members and attenders. The lists currently being managed by Helen, Pam, Valerie, and Sarah will be combined. Sarah requests data to be sent electronically by April 1st. Co-clerk will manage the Outlook database as part of co-clerk duties. We met on 3/2. With great joy we received a letter requesting membership from Sarah Shirk! Judy read the letter aloud, and it was received with great joy. A Clearness Committee has been formed & is being scheduled. Our next M&C meeting will be at 9:00am at OPAL on 3/30. The adult religious education video series Painting the Stars has a written guide that is available as PDF for advance preparation prior to the viewing of video program. Printed materials for this course will be put on the OPFM website and each week’s materials will be sent to the list. Chicago Friends School is hosting a gala fundraiser event on March 20, 2014. On-line auction is live at www.biddingforgood.com/chicagofriendssschool. State of Society report for ILYM is due June 1st. A pot-luck with attention to ILYM Queries for Reflecting on the Health of a Quaker Meeting will take place March 30th to prepare the State of Society report. Adrian will coordinate. May potluck will be moved to May 11th. May business meeting will be moved to May 18th to avoid conflicts with Mother’s Day. The meeting acknowledges Pete Seeger’s passing, and the joyful peace work he has done for many decades. Grammar and spelling corrections were noted and will be made by recording clerk on the on-line version of the minutes. Year-to-date income is $6,611 and year-to-date expense total is $7,570. Treasurer Valerie Lester has paid 75% of contribution to ILYM. Income and expenses are on target as budgeted. Ann Chase provided a written report of condensed M&C minutes. Clerk read the following report: "We opened with a period of silence. In response to a concern from our clerk of Meeting, Judy Erickson, we suggested she periodically send a message to members and attenders alerting us to the spiritual and community-building benefits of taking part in our monthly meeting for worship with attention to business. We held in the Light a beloved Friend who can attend Meeting only sporadically. Judy and Ann Chase will make a home visit to be followed by additional home visits from other members of M&C. We are reviewing how to approach newer attenders to learn what their questions, needs, and expectations might be. We closed with silence. " February, March& April Adult Religious Education will take place on the first First Day of each month at OPAL. The May meeting will take place off-site due to a non-Quaker event planned at OPAL. February topic will cover a contemporary Quaker. Chicago Friends School is hosting a gala fundraiser event on March 20, 2014. Donations are currently being accepted for on-line auction. See website for more details. No report. Did not meet in January due to Eagle Watch event. Sue Beckman was nominated for a 2-year term starting now, and Sarah Shirk was nominated for a two year term starting in August 2014. Mandy Gawf was nominated to serve now until August 2014. Bob Southworth will be convener of the nominating committee through the end of May 2014. These nominations were approved with gratitude. November 11, 2014 Chicago South Quarterly Discussion Meeting that took place at MCC Illiana, Portage, Indiana was presented in writing. Both Judy Erickson and Val Lester attended the meeting in person. After engaging in extensive discussion of the ideas presented in the document, we approve the vision, but our meeting cannot provide leadership for implementation of the vision at this time. Request was made by representative of Oak Park Art League for Friends to vacate OPAL before noon on May 4, 2014. Friends approved this request and clerk will confirm with OPAL. Quaker Practice in Action. We honor Pope Francis for living out the testimonies in his life of simplicity and commitment to the poor. Discussion of committee as a whole. After much seasoning, Helen and Valerie were approved as naming committee members to fill two spots on the nominating committee. Bob Southworth will continue in his third year on the nominating committee. We will continue with our current committee structures. Naming committee is able to nominate themselves to nominating committee. A called meeting or business meeting will be utilized to approve nominees for the nominating committee. Appreciation is expressed to current committees for their inspired and conscientious work. Finance Committee - Income for December $2,948, year-to-date income $6,228 and year-to-date expenses $6,259. All annual contributions have been made with the one exception of the food pantry. That contribution is being held until spring for the Feinstein challenge benefit. Thanks to generosity of Friends. No meeting due to weather. No report. Next meeting will be the first Sunday in February at 9am at OPAL. No report. January’s program is moved to February 1st Sunday. Topic is an historic Quaker to be announced. March meeting will be on a contemporary Quaker. Peace & Justice Committee - No report. Nominating Committee - No report. Quaker Practice in Action. We honor Nelson Mandela for his life of simplicity and integrity. 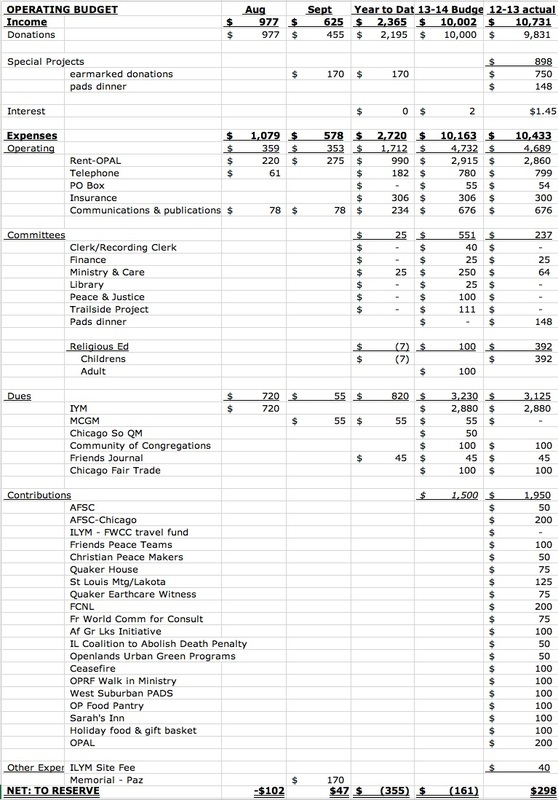 Finance Committee - Income year-to-date is $3,279 and Expense year-to-date is $4,336. The difference reduces the current reserves. Treasurer will send approved donations to match the prior year cycle. Oak Park Food pantry donation will be held for the spring Feinstein challenge grant. Will Rutt has been accepted as a member of Northside Meeting, and he will be dropped from the OPFM membership list. M&C Committee suggests examining our committee structure. Business meeting is asked to consider the ramifications of laying down the committee structure and to roll all committees into a committee of the whole during business meeting. Time demand of the business meeting could become excessive. Pro’s and con’s were discussed at length. Clerk will write up a summary, co-clerk will distribute, and more discussion will take place at January business meeting. (See summary attached). Nine people attended membership workshop. January 2, 2014 will be the next Adult Religious Education meeting. Ideas from Direction of the Meeting were discussed. Book meetings, spiritual support groups, video clubs, and worship sharing may be called for mid-week. Survey results suggest there is strong support for a book club. Children- Children are welcome to attend the Nutty Nutcracker on December 21st, 4pm at Dominican University and the Eagle Watch weekend at starved rock on January 25th. PADS dinner will be served January 31st. Children are invited to participate in ALL these activities and bring (F)friends. Staying overnight at McNabb after the eagle watch is optional. Contact Sarah for Nutcracker tickets and Valerie for Eagle Watch and PADS. Triton College star watch is in the planning stages for the spring. Report is attached. Community gardens and aquaponics were discussed. As a step toward collaborating with these groups Openlands and Sweet Water in Maywood will be contacted by committee members. Next meeting will be December 29, 2013. P&J is encouraging committee to attend the Eagle Watch in January. Nominating Committee- See ministry and care committee minute. 11/24 Chicago Quarterly discussion is attached. Will OPFM support this or not? Feedback is to go to Judy or Val. Come prepared to discuss it at the January business meeting. Pioneer Press ad was higher than budget permitted. Sue and Sarah coordinated the HFGB and will deliver gifts this week. Appreciation to coordinators was expressed. And due to a duplication, an additional donation of towels was made to PADS transitional shelter. The Ministry & Care Committee considered the charge from the November Business Meeting to find two additional people to work on the Nominating Committee this year. Ours is a very small Meeting, and active participants tend to participate in more than one committee, as well as managing family, work, and other volunteer tasks outside of the Meeting. This discussion led to a suggestion that was intended to lighten the loads carried by those active in our Meeting. The suggestion is to replace our current committee structure with a "Committee of the Whole." Ann Chase was a member of a monthly meeting that used this type of structure, and she thinks it may work for us. This Committee is composed of those who attend the monthly meeting for worship with concern for business, and they take care of all business together during worshipful business meetings. It was noted that, although there are many differences between their practices and ours, early Quakers met without elaborate committee structures. This suggestion was taken to the Business Meeting. Here are some comments from that Business Meeting discussion. · Official roles such as Clerk/Co-Clerks, Recording Clerk, ILYM Membership Recorder, etc. will still be needed and selecting them needs a process of discernment. · Communications would be simplified with fewer smaller meetings; it makes attending business meetings more important, and missing them could be a problem. · Would there be enough time during one business meeting per month to consider all the matters now seasoned by committees? Would it be too hard for attenders with other family commitments to stay for the entire meeting? · What would best express our testimonies of simplicity and integrity? · There may be a need for an occasional short-term (or "called") meeting to season specific, complex topics. · It would place a bigger burden on the Clerk. · One example was cited of one of our committees that stopped meeting when there was no clerk: Children's Religious Education, whose activities have decreased since there has been no clerk. · Could there be a workshop on how to clerk a committee? Could we ask for outside assistance with this from Joan Pine or Judy Wolicki? How would this Committee of the Whole solve the problem of overburdening our most active participants? 2) We brainstormed about what local issue we might take on. Most of the ideas centered on local groups arranging things like community gardens and/or aquaphonics. The two Chicago area groups we know about are Openlands and Sweetwater. But also the Quinn Center in Maywood and the rabbi at Harz ion Temple in River Forest work on these kinds of projects. Possible idea are arranging a presentation for us and or holding a fund raiser for them and even encouraging volunteerism, but first we need to educate ourselves better. Mandy agreed to contact Sweetwater, Judy will research what Openlands is doing, and Kelly will look into activities at the children’s garden in Berwyn. 3) Because it is Christmas eve and because the 4th Sunday is eagle Watch Weekend, we agreed to move the next P and J meeting from Sunday Dec 24th to the 5th Sunday, December 29th. 1. How can we incorporate ideas brought up in the Direction of the Meeting meeting? 2. We are not opposed to having the book study group be a med-week activity, but what about the other weeks in the month? Where? 3. Painting the Stars, a 7-session program combining articles, video, and discussion guide. * Kelly will bring microwave popcorn and a jar of almonds. * Cossy will bring a bag of cuties. * Cossy will cut out a dozen hands from construction paper, and bring a dozen pencils, and sheet of paper for journaling. * Kelly will contact Pam and Judy about membership letters and/or attending the workshop and giving their tale. Reading Read through the queries on handout which one do you really want to answer which one don’t you want to answer. Journaling Write your answer to the query which moved you most. Sharing The Experience of others, Read through other Friends letter and or have an experienced Friend talk about their membership process. Conclusion What’s the next step? We will be in contact, but either Monday Dec 30 or Thursday Jan 2nd good for Cossy. Quaker Practice in Action. Joan and Michael Pine have supported our meeting over time and distance. We appreciate their steadfast support. No formal report. Suggestion made for finance committee to look at reserves. Should reserves be used for stewardship or maintained for meeting expenses? What about renting space that is more focused on our needs? Finance committee is asked to hold a threshing session. No report. Adult religious committee education requests an M&C member to attend December 1, 2013 membership meeting. M&C will need to consider how to reach out to younger attenders. Adult Religious Education will cover the topic of membership on December 1, 2013 with an extended program from 11:30am-2:00pm. Committee will consider spending part of the budget for food at this meeting. We are holding the victims of the typhoon that hit the Philippine Islands in the light. Cossy requests to cycle off the nominating committee. Ministry and Care will find 2 people to serve on the naming committee for reporting to the February business meeting. Direction of the Meeting (DOM) Review- Each time a committee meets, they should consider the DOM input. The queries should be continued to be expanded at the committee level as living queries. Spiritual support in this group can be applied to a larger Quaker group at ILYM. Worship sessions can be expanded to a mid-week time slot. Movie, video, worship sharing, or book nights could be implemented mid-week. Living the Word video on religion & science will be reviewed by religious education committee. Chicago South Quarterly Meeting will take place on November 24, 2013 at 3:30pm in Portage, IN. Ideas and suggestion should go to Judy concerning starting up a Chicago South Quarterly Meeting. Holiday Potluck: Invitation for holiday potluck on 12/15 at 11:30am will be sent via weekly e-mail calendar to encourage participation. Listing in Pioneer Press Special Holiday Worship Guide - Do we want to be listed? Deadline and cost will be examined. Meeting approves up to $50 being spent for community outreach ad. Sarah will contact Pioneer press to find out details. Thanksgiving service for Community Congregation is on the horizon. It will take place at United Lutheran Church at 409 Greenfield Street in Oak Park on Sunday, November 24, 2013 at 7pm. Valerie will be contacted by Pam to see if OPFM will be represented. Quaker Practice in Action. We are grateful for the Quakers who are providing ongoing support for the Chicago Friends School. This school offers an educational experience that emphasizes Quaker values and witness. Their theme this year relates to care for bees which relates to this month’s queries on stewardship. Review September Minutes. Fix date in finance committee section. Instead of reading June 1st to May 31th, it should read June 1, 2013-May 31, 2014. Direction of the Meeting is planned for November 3, 2013 from 11:30am to 2pm. Judy will order pizza and Helen will provide fruit platter. Sarah will send request to OPAL board asking for extended stay to 2pm on November 3, 2013 and December 1, 2013. In addition she will request the heat to be operating. Judy and Sarah will review potential queries. Adult Religious Education will cover the topic of membership on December 1, 2013 with an extended program from 11:30am-2:00pm. Judy will promote the Dec. 1st event via MCGM listserve and announce at the Nov. meeting. Additional suggestions for topics are welcome. Children's Education- Although our OPFM does not have any children currently participating, the Chicago Friends School is available for members wanting to serve children. Two High School Quakes will be provided by ILYM, the first is in St. Louis from 11/8/13 to 11/10/13 and the second in Evanston from 1/17/14 to 1/20/14. Recommendations for annual contributions were approved as presented in the P&J minutes. Each donation was reviewed with a general description of the service provided by the organization and how it fits into our Quaker ministry. OPRF Walk-in Ministry has a new name. It is now called PREVAIL. Adopting an annual project for fundraising this year is approved, but we prefer it to be a local organization. West Suburban PADS, Oak Park Food Pantry, Sarah’s Inn, Holiday Food and Gift Basket, and PREVAIL were all mentioned as possibilities. Each is networked and frequently serves the same individuals in our community. PADS is collecting house to home kits for families entering open door housing program. Our meeting could help with in-kind donations in this realm. Mandy Gawf gave an update of the PADS Open Door Housing Program. Nominating Committee- Burke Shipley is approved as librarian for a one year term. Chicago South Quarterly meeting has been scheduled for November 24, 2013 at 3:30pm-6pm in Portage, IN. Judy will report on that at the Dec. business meeting. Communication to the CFG/MCGM outreach committee about the ad was discussed. Fifty five dollars was sent to the general fund. Judy read the letter sent to CFG and Tom Fairbank replied with gratitude. The questions will be forwarded to the Downer’s Grove committee handling the Zarembka event. Quaker Practice in Action. Honoring the life of Paz St. John, his memorial minute was read by all in attendance. Finance Committee/Treasurer’s Report. Fiscal year to date donations total $1,840. Budgeted income equals $10,002 and budgeted expenses equal $10,163. FY is June 1, 2013 to May 31, 2014. Peace and Justice Committee will need to allocate the budgeted amount of $1,500. Minute: Budget approved as presented. Ministry & Care Committee. Meeting minutes were read by Pam Timme and are attached. Direction of the meeting is scheduled for November 3, 2013 at 11:30am. Request was received from Wilmer Rutt for a transfer of membership to Northside Friends Meeting. Letter reviewed, edited, and approved. The ILYM scheduling was discussed. Spring continuing committee notes on this topic will be reviewed by Judy, and that report will be resubmitted. Donation to MCGM WBEZ outreach discussed. The radio versions were distributed with the goal and background on this outreach effort. A check for $55 was approved for MCGM general fund. A letter with suggestions for surveying event attenders, distributing Friends meeting locations, and utilizing other outreach efforts via social media will also be sent to the committee. Funeral expenses for Paz St. John were discussed. A donation to Northside meeting in memory of Paz was approved for $100 from the sufferings fund. This donation may be used for funeral expenses or a peace organization that Paz supported. Peace & Justice Committee: Next meeting September 22, 2013 and donations budget will be discussed. Religious Education, Adults. Committee will meet September 11, 2013. Thanks to Cossy for presenting Douglass Steere pamphlet at the September 1st adult religious education event. Religious Education, Children. No report. Nominating Committee. Judy will represent OPFM at Chicago South Quarterly Meeting. Valerie will serve as a back-up representative. Kelly will be representative for the Trailside garden. Nominees approved. New Business. Valerie will make reservation for Clear Creek House for Eagle Watch Weekend end of January . 9/22 Val will open & close. Pam will clerk. We began at 9:00am with silent worship. We reviewed the Minutes from our July 7th meeting. There was no mention of who offered to contact Sarah to reimburse her for the gift basket; Pam offered to do so. We do not understand “TK” in the Minute about the Statistical Report; Pam will ask Adrian what it means. Judy brought several clerking items for seasoning. · She will be out of town on 9/22 and needs to find someone to fill in as clerk on that day. Pam will check her calendar. · Possible dates for the Direction of the Meeting event are 9/29 (a fifth Sunday), 10/6 and 11/3; Pam will ask Ann Chase when she may be available; there is no need to hold this event before her return. Judy will also put this on the 9/8 agenda. When we have a date we will contact Joan Pine and Judy Wolicki (ILYM Field Secretary). · Wil Rutt has asked us to transfer his membership to Northside MM. We reviewed the process. Pam lent Judy a sample letter; Judy will compose and circulate to this committee this week a draft letter to bring to business meeting on 9/8. · The ILYM M&A Committee, through Joan Pine, has asked each MM to discuss ILYM scheduling at it September business meeting. Although we already gave feedback on this at Spring CC, Judy will put this on the agenda for 9/8. · We discussed a request for a donation of $50 to help fund announcements on WBEZ about the David Zarembka presentation at Downers Grove MM on 10/19, in the service of Chicago-area Quaker outreach. Judy will ask Pam Wolfe for a copy of the Minutes of the 4/20 CFG/MCGM meeting. She will bring all relevant materials to the 9/8 meeting. · Also on 9/8 we will discuss a possible donation to honor Paz St. John, who died last week. Possibilities are contributing to funeral costs or donating to an organization that was important to him. This donation could come out of our Committee’s budget when it is approved. Pam will ask Beth Burbank of Northside MM what plans they may have. The M&C Committee discussed following up with an attender who had been absent for a number of weeks, and also discussed an update on another long-time attender. Pam offered to follow up with Sue B. about the Visitor Log. The meeting ended at 9:57am with silent worship. Respectfully submitted by Judy Erickson, taking Minutes for Adrian who could not attend. Quaker Practice in Action. Judy had an encounter with a man begging in downtown Chicago and after looking at each other in the light, he helped Judy see that people in those situations are worthy of integrity and respect. We saw the light of God in each other. Finance Committee/Treasurer’s Report. Balanced budget was presented. Year to date income is $763 and expenses are $1,284. IYM dues are budgeted at $220 per resident member. Funds totaling $111 are available for the trailside garden. QEW provided these funds in a grant. Nominating committee will be asked to find a project coordinator for the trailside stewardship. The attached DRAFT budget was seasoned and will be brought forward for approval at the September business meeting. Ministry & Care Committee. No report as they did not meet this month. A budget is being seasoned via e-mail. Religious Education, Adults. No report. Ideas can be directed to Cossy & Kelly for future Adult Religious Education programming. Peace & Justice Committee. The next meeting will be on August 25th at OPAL at 11:30. The donation budget will be on the agenda. All are welcome to attend. Nominating Committee. No report. Chicago South Quarterly Meeting needs 1-2 representatives from OPFM. Judy will send background information and update to OPFM nominating committee. Decision should be made by second first day of September. Nominations can be presented at business meeting for approval. New Business. Ministry & Care Committee is asked to plan the Direction of the Meeting meeting, pick a date, and invite our liaisons from ILYM. Announcements. August is Free Book Month. 8/18 will be include music before meeting for worship and potluck after. 8/31 Eighth Annual Old-Fashioned Corn Roast and Pot Luck Picnic hosted by Upper Fox Valley Quaker Meeting. Quaker Practice in Action. We are inspired by the international cooperation in the example of the fire in Lac Megantic, Quebec, caused by a train derailment. Fire departments from western Maine were called and responded to a request for help from Lac Megantic. The Maine fire departments may not usually speak French very well, so cooperation may have provided an opportunity for cross cultural experience. Finance Committee/Treasurer's Report. Val reminds Committee Clerks to submit their budgets before September. Income to date is $658 and expenses to date are $1,010 since the new fiscal year began on June 1st. Ministry & Care Committee. When there are children among us, there should be at least two adults with them. This does not apply to family members of the child. This M&C decision and the entire M&C report were approved and accepted with thanks. Religious Education, Adults. Six people attended the labyrinth walk at Garfield Park Conservatory on July 7th. It was quite successful. Religious Education, Children. It is clear that we have laid down the practice of First Day School on the third First Day of the month. Val offered to review and edit announcements in Wednesday Journal and Friends Journal. Judy will do so for the website. We are open to reconsidering our resources and practices when the need arises. Peace & Justice Committee. The next meeting will be on August 25th. The donation budget will be on the agenda. Nominating Committee. Cossy has informed us that they are still looking for a volunteer to coordinate the library. New Business. We discussed the suggestion of sending representatives to a meeting to discuss the possibility of forming a new ILYM quarterly meeting among the Chicago South Planning Group Meetings. We have reservations about our ability to support a quarterly meeting, but we are open to discussing it if there is broad participation from the Chicago South Meetings. If a meeting is scheduled to explore this possibility and all other Chicago South Meetings agree to send a representative, then Oak Park will also send a representative. Announcement. Val donated a pamphlet from Alexandria Monthly Meeting (VA) entitled "Guidelines for Marriage." We thanked her. Judy will bring it to the next M&C Committee meeting. Quaker Practice in Action: Simple, flexible framework of Yearly Meeting gathering allows community to continue thus maintaining the tradition of attending Yearly Meeting for more than a century. Committee clerks need to contemplate budget for 2013-2014. Val will contact clerks for amounts. Report accepted as presented. What to do with donated materials until there is a new librarian? Minute approved: Judy will process last year’s donations, but will not process new donations. Helen offered to store new library donations in her garage until a librarian steps forward. Pam will add newsletter announcement to limit donations. Cork board currently stored in library is available free to a good home. Approve definition of “non-resident member” as a member who has not attended OPFM in a year, but who has not transferred nor resigned membership? Minute: Assessment is only for resident members. Sharon Haworth will be consulted on how to define a non-resident member. A donation of $25 is to be sent from OPFM to West Suburban PADS in honor of the marriage of Kelly Maynard and Rick Spiwak. Adult Religious Education Committee. NO REPORT Adults and children are invited to the July 7th labyrinth event at Garfield Park Conservatory after meeting for worship. Children’s Religious Education Committee: NO REPORT. Children’s RE committee has dissolved. Future planning will take place at next business meeting. Children can use supplies provided on first floor or play outside or upstairs with a friendly adult. This minute is approved. Nominating Committee: Nominating Committee nominates Sarah Shirk as recording clerk. We approve this nomination as well as those made in May. We appreciate the efforts of the nominating committee. Old Business: The State of Society report was changed according to the May 12th Minutes, and emailed to ILYM/Sharon Haworth. All State of Society reports are published in the annual ILYM Minute Books, which can also be found online at ilym.org. New Business: Will we maintain our regular schedule of business/committee meetings and potlucks during the summer, or change them? Potluck (7/21), (8/18) will continue as usual. Clerks can decide summer schedules for other committees. Business Meeting in July will be reviewed end of June and August meeting will take place as usual on 8/11.